The Muslim and Buddhist communities are the two largest religious communities in Asia. More than three fifths of the world’s Muslims are found in various parts of Asia. Likewise, the vast majority of the world’s Buddhists live in this continent – the continent that gave birth to all the world’s religions. 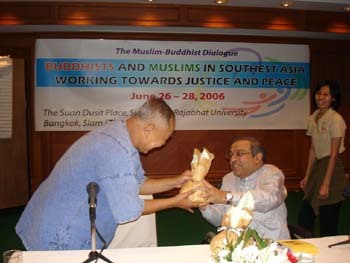 Interaction between Muslims and Buddhists is therefore not only inevitable but also imperative. On the whole the two communities have maintained harmonious relations since time immemorial. Muslims came into contact with Buddhists from the late seventh century onwards, in places such as Eastern Persia, Afghanistan, Sind and of course, China. Though Muslim military conquests were part of this initial contact, there is also ample evidence to show that the interactions between Muslim Sufis and ordinary Buddhists were much more enduring. Indeed, the spread of Islam in what were Buddhist regions was due largely to these gentle Sufis with their peaceful, universal approach to religion. It was partly because of the congenial atmosphere that they created that Muslim scholars wrote in such glowing terms about the Buddhists that they encountered. One such account came from Ibn-a-Nadim (died 995) who praised the courtesy, the kindness and the compassion of the Buddhists living in his midst. The illustrious savant, Al-Biruni (died 1051), who was undoubtedly the first, and one of the greatest students of comparative religion in history, even produced a book on Buddhist monuments in Afghanistan entitled ” The Story of the Two Statues of Bamiyan.” His account is of special significance in view of the destruction of those statues by the bigoted Taliban regime in Afghanistan in 2001. Another towering figure of Islamic scholarship from the early period, Al-Shahristani, who lived in the twelfth century and who is widely regarded as the first person to author an encyclopaedia of religions, also discussed the Buddha and Buddhism with a great deal of understanding and objectivity. He probed the five precepts (Panca Sila) and the ten precepts (Dasa Sila) in the Buddhist texts and even identified the Buddha with the Quranic figure of Al_ Khidr whom the majority of Quranic commentators accept as a Prophet. The fourteenth century scholar, Rasheeduddin Fadlullah, was yet another outstanding student of Buddhism who focussed upon the sublime life of Sakyamuni (the Buddha). In recent times, Muslim scholars such as Hamidullah, Seyyed Hossein Nasr, Chaiwat Satha-Anand and Imtiyaz Yusuf, among others, have adopted an empathetic approach to Buddhism in their writings. However, what is of greater significance is the actual attitude of the followers of the two religions towards one another. Indonesia, the world?s most populous Muslim state, chose to recognise Buddhism, practised by a minuscule minority, as one of its official religions at the time of Independence in 1945. In the course of the last 58 years, the largely Muslim ruling elite has protected the nation?s Buddhist heritage, (the ruling class was Hindu-Buddhist in its religious orientation before the advent of Islam in Indonesia in the 14th century) including the famous Borobodur, allowed Buddhists to observe their rituals and practices and even provided some scope for Buddhist-Muslim dialogue. It is of course true that since the economic crisis of 1997-8 and the collapse of the autocratic Suharto regime, there has been some uneasiness in the relations between the two communities. But this is a consequence, it must be emphasised, of the socio-economic and socio-political situation rather than a result of religious antagonism per se. Muslim majority Malaysia is another example of a Southeast Asian country which has been most accommodative towards its non-Muslim minorities, including Buddhists who constitute about 25 percent of the population. Not only is Buddhism practised with full freedom, persons of the Buddhist faith constitute a dynamic force in the Malaysian economy and participate actively in Malaysian politics. There have been Buddhist legislators, for instance, at State and Federal levels since Independence in 1957. Buddhists have been Ministers and Deputy Ministers in the Malaysian government for the last 45 years. They are an accepted feature of Malaysian public and social life. This does not mean that the Buddhist minority does not have any problems vis-?-vis the practice of its faith. But the Buddhist situation in Malaysia taken as a whole deserves an accolade. Buddhist majority Thailand has also succeeded to a great extent in protecting the interests of its small Muslim minority. Mosques continue to be built and Islamic schools continue to grow especially in the southern part of the country. Muslims contribute to the economy while a few of them have managed to enter parliament. In fact, in the course of the last 10 years, a Muslim has become the Speaker of Parliament while another has served as Foreign Minister. The political accommodation of Thai Muslims is, in a sense, a relatively recent phenomenon. There was a time when the community felt excluded from the political process and viewed itself as a marginalised religious minority. It was democracy and the institutionalisation of civilian rule which endowed the Muslim with a presence and a role. So far we have looked at the positive side of Muslim-Buddhist relations in various parts of Asia. There is, however, a negative side too which should be noted. The Taliban, as we have observed, destroyed the ancient Buddhist statues at Bamiyan in Afghanistan. The Khmer Rouge persecuted and even attempted to eliminate the Muslim minority in Cambodia. However, if we reflect more deeply upon these two episodes we will realise that religion had nothing to do with the misdeeds of these two groups. The Taliban?s brand of Islam was roundly condemned by the vast majority of Muslim theologians long before September 11. Its atavistic, dogmatic approach to the religion especially on matters pertaining to women, non-Muslim minorities and law, evoked the wrath of both the Muslim people and Muslim governments. This explains why only 3 out of 57 Organisation of Islamic Conference (OIC) countries recognised the Taliban when it was in power from 1996 to 2001. Its pariah status meant in effect that its ideological position had no legitimacy at all in the Muslim world. Likewise, the Khmer Rouge leadership which regarded itself as a pure, puritanical Marxist government, had disavowed Buddhism even before it attained power. It dismissed religion ? all religions ? as myth and superstition. Faith and Transcendence had no place in its vision of a classless, egalitarian Utopia. It is important to reiterate: from an Islamic point of view, the Taliban was a terrible aberration while the Khmer Rouge?s unmitigated cruelty was a total repudiation of Buddhist compassion. That Muslims and Buddhists can live side by side is an indisputable fact, proven over and over again in different parts of Asia right through the centuries. But peaceful coexistence alone is not enough. Can Muslims and Buddhists, guided by their respective teachings, meet the challenge of development and the global system in the present era? Can we harness our values and worldviews in order to create a just and compassionate Asia? There is no denying that in a number of societies where Muslims and Buddhists live cheek by jowl, economic and social development has generated positive changes which the two religions would endorse without hesitation. Poverty has been reduced; literacy rates have increased; health care facilities have improved. More people today have access to piped water, electricity and modern sanitation in Malaysia, Thailand and Indonesia compared to 30 years ago. In a nutshell, some justice has been delivered to sections of the populace. The welfare of sections of the citizenry has been taken care of. There appears to be some compassion at least on the part of the elites of certain Asian societies. At the same time, however, a great deal of what is happening in Indonesia, Thailand and Malaysia, among other Asian countries, would be antithetical to the noble values embodied in the philosophies of Islam and Buddhism and indeed, other religions. Elite opulence and extravagance have reached new heights. Corruption and abuse of power are rampant. Greed and acquisitiveness within the upper crust of society have become endemic. There are rulers who have little respect for dissent and have no qualms about strangulating legitimate protest on behalf of the poor and powerless. Ethnic prejudice, religious bigotry and communal hatred continue to manifest themselves in the political and social life of the continent. Though the root causes of the malaise that confronts us are varied, we shall highlight two of them. The pursuit of elite interests to the detriment of the people?s well-being is responsible for a whole spectrum of ills ? from opulence to corruption to authoritarianism. It is because of elite interests that there is often a yawning gap between what is professed and what is practised. It is because of elite interests that ideals are seldom translated into realities. The global system, geared as it is to corporate, casino, consumerist (3C) Capitalism, has also caused much suffering and misery to ordinary women and men everywhere. 3C Capitalism has not only led to greater concentration of wealth in the hands of a few but also greater centralisation of information, knowledge and technology. Consequently, it has reinforced the hegemonic pattern of power associated with the global economy, global politics, global culture and indeed the global media. Needless to say, this hegemony helmed by the Washington elite is buttressed by American military muscle. As we have stated so often in the past, hegemonic 3C Capitalism undergirded by crass militarism has legitimised greed and sanctified acquisitiveness as never before in human history. If unlimited accumulation of wealth is a sin in Islam, unending consumption of material possessions is a form of serfdom in Buddhism. The wealth accumulation of the elite and the consumption pattern of the middle and upper classes have diverted our attention from what is real and perennial in life ? truth and justice, compassion and conviviality, love and beauty. Religion seeks to connect the human being to what is real and perennial. This is why it enunciates the primacy of the spiritual and the moral, as against the material and the sensate. For Islam, the root of that spiritual basis of human existence is God; for Buddhism, it is Nibbana. But for both spirituality is the essence of life. This first principle in the two religions? worldview is linked to two other inter-related principles: the principle of upholding what is right and the principle of prohibiting what is wrong. It is significant that the concept of virtue in Islam and Buddhism bears many striking similarities. Honesty, truthfulness, kindness, a sense of justice, a feeling of compassion towards the weak are values which both religions cherish. Justice is the leitmotif of the Quran. Justice was the hallmark of the Buddhist emperor, Asoka. Compassion was the outstanding quality of the Buddha. Every chapter in the Quran begins with the phrase, ?In the name of God, the Compassionate, the Merciful?? The concept of right and wrong found in Islam and Buddhism suggests that the basic moral structure in the two religions is quite similar. Out of this moral structure, we have derived 7 principles applicable to different spheres of living which run parallel in Islam and Buddhism. At this point we are merely stating these principles without elaborating on them. Elaboration and analysis will be done in some future essay. 7) Evolving a culture that strengthens human character and fortifies values such as justice, compassion, love, freedom and honesty. These shared moral values, it should be clarified, do not imply that the two religions are the same. We know that there are vast differences in theology, philosophy and ritual which distinguish Islam from Buddhism. Nonetheless, they uphold certain common ethical principles which are fundamental to the life of a practising Muslim or Buddhist. To return to these guiding principles which we have propounded as an alternative to the dominant 3C Capitalism of the present, one will detect a 1+2+7 formula at work. We begin with spirituality as the fundamental principle, which in turn is related to the twin concept of right and wrong, which in turn is linked to the seven principles of living. This 1+2+7 formula which could serve as a basis for Muslim-Buddhist cooperation has to be further refined and developed. Nonetheless, it suggests that Muslims and Buddhists can work together guided by shared principles and values for the larger good of humankind. The 1+2+7 formula could be a framework of sorts for adopting joint stands on national and international issues. Muslims and Buddhists should not only advocate shared positions. They should organise public campaigns and mobilise the people in matters of common concern. This will help to create stronger bonds between members of the two communities. Whatever the strategies we choose to adopt in the future, one thing is clear. The age of mere Muslim-Buddhist co-existence is over. Muslims and Buddhists and people of other faiths should join hands and work towards the transformation of Asia and the world in accordance with those sublime values and worldviews which lie at the heart of all our religions. Failure to achieve such a transformation would tantamount to a betrayal of Asia?s eternal message to humankind. For the womb that bore the planet?s religions never regarded the relentless pursuit of wealth and power as the cardinal goal of life. It is faith in the Transcendent, in the Eternal Truth, in God, expressed through noble deeds that endows meaning and purpose to human existence. This is why we should never ever be part of a crusade to establish a hegemonic, capitalistic, militaristic global system. Our mission is, and has always been, the creation of a just, compassionate, humane universal civilisation founded upon a spiritual-moral ethic. This essay was written in 2002 before the disturbances in Southern Thailand which began in January 2004.